February 15, 2014 - 6 Comments. 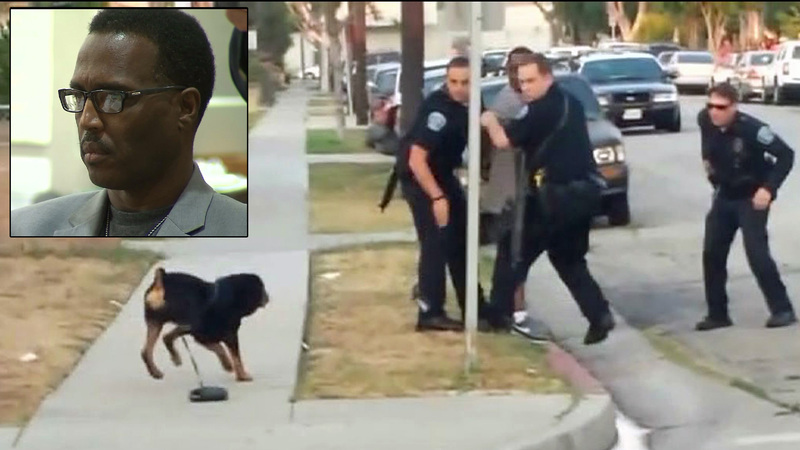 Police officers in Hawthorne, California shot and killed the dog of a man who was filming a barricade situation, and the moment was captured in a video that has now gone viral. The video of the Hawthorne police dog shooting was uploaded to YouTube on June 30, showing police gathered at a barricade. On the video, Leon Rosby is watching the situation and taking video of SWAT officers as he walked his leashed Rottweiler. Rosby appears to be yelling something at police officers, who eventually move toward him. The man brings his dog back into a car while he again engages with police, who handcuff him. As police are detaining Rosby, the dog wiggles out of an opened window on the car and moves toward officers. The dog barks at them but appears to back down when one of the officers shouts at it. But then another officer approaches, causing the dog to jump. At that point, the Hawthorne police officer fired five shots, killing the dog. Attorney Michael Gulden, who represents Rosby, said his client plans to sue the Hawthorne Police Department for killing the dog. The department has not yet responded to the incident. Video of the debate made its way around the internet on Monday. On the link-sharing site Reddit, it sparked a lively debate over whether the police officer was justified in killing the dog. Still others said the officer was justified as the dog was a threat. They also pointed out that it appeared Rosby was antagonizing police in an already tense situation, and was seen on another video blasting music. Video of Hawthorne police killing the dog can be seen here. Be warned: The images are graphic. smile on your face which would remain throughout the day. After about 20 minutes he returned from the kitchen and handed her a plate of bacon and eggs. town with a foreign-sounding alternative. Should Facebook host terrorist filth ?